The well known calligrapher Tom Fleming is a Scot, born in Armadale, West Lothian. In 1935 he began work with the United Collieries Ltd as a Mine Surveyor and cultivated a keen interest in lettering and designing posters. In 1940 he volunteered to serve in the Royal Army Medical Corps, and was posted to 168 (City of London) Light Field Ambulance. His army service took him to Syria and the Western Desert and then to North West Europe with the 8th Armoured Brigade to France, Belgium, Holland, Germany and finally Berlin in 1947. After the war he returned to Mine Surveying in Scotland and was awarded his Certificate in 1948 and the City & Guilds Bronze medal. In 1953 he came south to Northumberland as Surveyor at Lynemouth Colliery which was the largest undersea coal mine in Europe at that time. In 1960 he decided to attend Newcastle University in the evening to obtain his Certificate of Fine Art specializing in calligraphy. In 1977 Tom decorated a mother of pearl shell with a message from the People of North East England and it was selected as one of the gifts to be displayed at St James’s Palace in London to commemorate the Queen’s Silver Jubilee. In the same year Tom designed a map showing the friendship link between Newcastle upon Tyne and Atlanta, Georgia, USA when he attended the first Friendship Force exchange between the two cities. A copy of the map was sent to Rosemary Carter, wife of President Jimmy Carter, by Peter Jay at the British Embassy in Washington. Tom Fleming has been chairman of Northumbrian Scribes since its formation in 1989 and the membership has risen from eight to eighty eight in the year 2000. 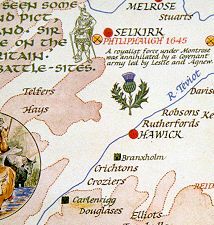 On his retirement in 1979 Tom started to design calligraphic maps and his first effort featured Northumberland. Sir John Hall of Metro fame saw the original map and suggested that Tom have the map printed to share with others. In 1983 he organized 2,000 prints to be run off and so far 9,000 prints have been sold. It is an ideal present for Northumbrians at home or abroad. Burns Country, Ayrshire was designed in 1985 for one of his national Coal Board colleagues, if features couplets from Robert Burns’ poems and would grace the homes of lovers of Burns’ poetry and members of Burns’ Societies worldwide. The Isle of Mull map was created in 1990 for Dr Neil MacKichan who has a craft shop on this beautiful Island. It features paintings of birds and animals, and the crests of MacKinnon, Maclaine, MacQuarrie, Maclean and many items of historical interest including the island of Iona. The map wishes everyone a hundred thousand welcomes in Gaelic. The Border Battlefields and Reivers’ Families was commissioned by Border Art in 1995 - it features the names of the Reiver Families and shows sites of Battles in the Scottish/England border area and many items of historical interest including the island of Iona. It features a border of crossed swords and shields with a background of red dots to symbolize the blood that has been spilled in this area over the years. The Warwickshire map was designed in 1999, at the suggestion of his son, Donald who lives in Leamington Spa and escorted Japanese visitors to places of interest. He felt there was a need for an attractive calligraphic map; the map was created and based on the 1973 boundary. The town crests of Birmingham, Warwick, Lemington Spa, Kenilworth, Coventry, Nuneaton, Rugby and Stratford are all beautifully shown in full colour as well as a portrait of William Shakespeare who was voted “The man of the millennium”. Tom Fleming’s map of Lindisfarne - Holy Island is based on an illumination in the Lindisfarne Gospels, produced at the end of the seventh century, in the monastery on the island. The map includes drawings of the Priory, the Pilgrim's Way and the statue of St Aidan, as well as paintings of the birds belonging to Lindisfarne, this Holy island steeped in history. Tom has also produced a number of smaller works and two of these, “Death is nothing at all” from Canon Scott Holland “Facts of Faith” and “The End of Coal Mines in Northumberland” are available as photographic prints.